One of the great moments in global radio is BBC Four’s “Thought for the Day.” Greek state broadcaster ERT is one of many that have adopted the format, giving a couple of minutes of airtime on its Second Program to the great and good musing about faith, current affairs and life in general. One can only wonder, though, exactly what the government’s thought for the day was when it decided to shut down ERT and dismiss some 2,700 staff on Tuesday. There was plenty wrong with ERT, which had long been treated like most other parts of the public sector by successive governments who felt they had supporters to take care of and money to burn. Its 19 regional radio stations speak of an excess that was simply unsustainable. Thessaloniki, a city with 800,000 inhabitants, had three radio stations when Inner London, which has a population of more than 3 million, has only one. There was also a lot to cherish about ERT, though. It continued to make challenging documentaries when practically nobody else in Greece did. Its stations played music that nobody else would. Even its insistence on sticking with tinny 80s theme tunes for its news and sports shows had a naive charm about it. Most of all, though, it did the job that all national broadcasters should do by being a common reference point for millions. There are few more emotional experiences one can have listening to the radio than hearing Diaspora Greeks cast to the four corners of the earth calling in to a Saturday night show on the Second Program to request Greek songs and share their memories and feelings about the homeland they left behind. There was certainly no such sentimentality in the government’s decision to announce ERT’s closure and pull the plug within a few hours. There was no debate in Parliament, no public discussion and no consent from New Democracy’s coalition partners, PASOK and Democratic Left. Instead, a legislative decree was passed to allow ministers to close public enterprises and government spokesman Simos Kedikoglou appeared on TV to inform the public that ERT had become a bottomless pit, absorbing 300 million euros a year in license fees and producing mismanagement and inefficiency rather than good TV and radio programs. With an unstilted delivery any news anchor would have been proud of, Kedikoglou said all this without acknowledging that it was New Democracy and PASOK that had picked all of ERT’s directors in previous years and stuffed the organization as full of journalists and managers friendly to their particular causes as they could. ERT is one of many illicit affairs that these two parties would like to sweep under the carpet. How better to do it than to execute the corporation’s closure at the same time as the troika is in Athens wondering what happened to the coalition’s promise to fire 2,000 civil servants this summer? Greece’s lenders, after all, were looking for a “game changer.” Which way will the game go though? The decision to close ERT has apparently come from the top but in making this choice, Prime Minister Antonis Samaras also takes a huge risk. His decision for a “bold” move that would make up for the government’s inability to chip away at the civil service by firing offenders and non-performers has ample potential to backfire. It’s true that Samaras has stolen a march on his coalition partners, forcing them to put up or shut up in the government’s bid to meet troika targets. But is this the best way to ensure the coalition remains intact and functioning? It’s also true that Samaras’s move shoves SYRIZA center stage, where it will have to show if it possesses the wherewithal to harness whatever anger is created by ERT’s closure. But is it really wise to stoke the forces of protest and resistance when they appear to have abated? It’s likely that there are Greeks who will interpret shutting down ERT as an indication that the government is willing to confront its challenges head-on. There are others, though, who will feel uncomfortable, even angered, by riot police standing in front of the country’s public broadcaster – imagery that conjures up painful memories in a country that lived through a dictatorship in the not-too-distant past. A lot could ride on whether Greeks genuinely believe this is an attempt to shake up the public sector and shake out its most negative elements. The government says that in the months to come, it will reopen ERT under a new name and with fewer employees. However, will people really trust the parties who created the unstable structure they built over the years to rebuild it as a fairer and more productive edifice? Can they really put their faith in New Democracy, which in 2011 opposed a PASOK plan to restructure ERT, saying the broadcaster should be safeguarded from such action? There’s a thought for the days ahead. This entry was posted in Greece, Media and tagged Antonis Samaras, Democratic Left, ERT, Greece, New Democracy, PASOK, Public broadcasting, Radio, TV. Bookmark the permalink. The response of New Democracy to this complaint came yesterday. To add to your description of ERT: apart from it being the only broadcaster in Greece of high cultural programming (classical music, dance, theatre, art, architecture, landscaping) it also (1) carries all the church services – an important part of our cultural life and a boon to remote communities, the old, ill and housebound, (2) is responsible for the irreplaceable national archive of radio, television and historic photographs, (3) is the only broadcast corporation obliged to provide equal time to all political parties and (4) is obliged to cancel light programming to cover important events. ERT also regularly offers excellent scientific and historical programs, including my favorite, the daily and quite moving “What Happened Today” of world events in history (with images drawn from its archives and excellent commentary) that immediately precedes the news. Last night, as ERT went black, not one private TV channel cancelled its light programming to report this. Not one private channel thought the sudden closure of the state broadcasting company was worth covering. Effectively the news shut down last night in Greece and greeks alarmed and concerned by this enormous public event were….literally!….left in the dark. The only precedents for this was the closure of ERT by the Nazis in 1941, and all too frequent shutdowns by the junta. Here is another thought of the day: Let’s dispense with political hypocrisy. The so called coalition government have ceased to be a functioning unit the minute PASOK and DHMAR took it upon themselves that they had enough with austerity and that they also had enough with Samaras taking all the credit and treating them as junior partners. To suggest that the temporary closing (ERT going off the air until August) is now a watershed event, I find it outrageously hypocritical. This move comes down to pure political calculation. If this fragile coalition falls and a new government is elected, ND would still be the lead party (with the 50 parliament seat bonus intact), PASOK would drop down to 5% (from the 11% it had a year ago – which in practical terms will force PASOK into bankruptcy), DHMAR will get pretty much the same 4% it got last time and SYRIZA just about equal with ND (but without the parliamentary bonus and perhaps a small loss in the process). The biggest winner of such election would be the despicable Golden Dawn which will entrench itself as the 3rd largest political party after ND and SYRIZA. For those naïve enough and having a death wish of elevating illegality to the position of 3rd largest political party, one has to question their IQ for deciding to do all this over a 3 month hiatus for a public broadcaster with an unquestionable need for some serious cleaning up. Go ahead; make the fascists day! In a span of 3 weeks the Greek left foaming at the mouth with the thought that Samaras could be credited with any success, has managed to reverse all progress and drive yields on the 10 YR bonds 200 basis points up. At this rate of self-destruction not only Greece would be unable to rid of the hated Troika but it would suffer additional austerity measures. No doubt what you are saying is true. And it would be true anyway. But it has little to do with the ERT shutdown. And we’re talking about ERT here. 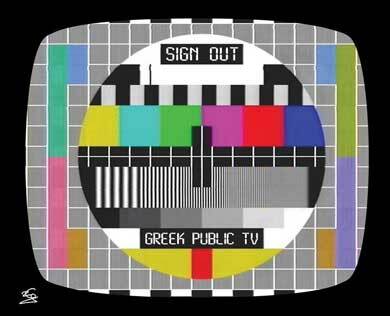 The fact is that Greece’s public broadcasting system has been abruptly closed. Blame has been loudly laid on ERT – in the exact same way that Greece was blamed and vilified for what is in reality the EU’s systemic failure. So ERT – an organisation that consistently met its enormous technical and professional obligations – is vilified for mistakes not of its making and wholly outside its remit ie the “opacity and wastage” of successive politicians’ and governments’ corruption, rousfetia, failure to respect ERT’s independance, appointment of incompetent partisan CEOs etc etc. It is a MIRACLE that ERT managed to survive this endless onslaught and still continue to produce the goods. High quality goods. Three years have gone by without a single public firing. Whose fault is that? Now, two days before today’s Eurogroup meeting to decide the next 3.3bn tranche – dependant on firing 2000 people before end June – ERT is shut down, accounting for 2565 firings. And vilified for what is in reality government failings. Can you honestly say that this totally hamhanded and desperado move, plus the shock elimination of an EU public broadcasting system, makes Greece look like a competent and serious country worth investing in? Not a banana republic of dangerous clowns? IMHO it makes us look ridiculous, untrustworthy and totally incompetent. Competent first world countries restructure public corporations without shutting them down. Competent first world countries never resort to the removal of a ‘necessary common good’ – ie acquis communaire. Competence can easily find 2000 firings in the time given – starting with relieving ERT of the recent and present government’s 1000+ fake appointments burdening the corporation. Of course you are correct. But here is the thing. If you have an opposition like Syriza which paints the failed attempt of selling DEPA an avoidance of public sellout (therefore a good thing), it then opposes the government every step of the way from meeting its targets (because of course Syriza very well knows that getting the next tranche is target dependent) and in general showing consistent obstructionism in everything officially attempted, what do you expect? Syriza is faulting the feeble coalition government every step of the way and in essence accusing the government for not doing things the Syriza way. But if the Greek people wanted the Syriza way they would have voted Syriza to be the #1 party. They didn’t. And the polls show that they will not either in the future. Are you faulting the government of striking back where it hurts Syriza the most as a sweet thank you for all the damage done by Syriza the last 3 weeks? In which other country the opposition could make 20% evaporate from its stock market ( on the grounds of mocking the “success” story). Therefore, if you deny the government the tools it needs to do its job then it would strike back where it hurts the most. That’s 100% expected. If Syriza wanted a sweeter consideration on ERT it should have kept its mouth shut and show that it has to offer something of value to the other side. If Syriza’s mission in life is to be an annoying gadfly it will be treated as one. It happens in every other part of the world. BTW, because I had enough for this melodrama with ERT. The deal with Berlin is this. If Greece fires 2000 people by the end of June, then Greece is allowed to hire back 12000 people based on merit and for the posts needed. Guess what: The same people fired would be re-evaluated and hired back minus the political appointees. So, what is this daily drama about the screen going black and similar dramatics? The screen will be back on but Syriza and KKE and PASOK and ND would not have their people meddling in the new ERT. Why is this a bad thing? We arrived back in Austria last evening and ERT World (via satellite) was blank. Today, it is working again and it seems normal. How can they broadcast if the government has allegedly shut down everything? Are we watching the ‘legal’ ERT or the ‘illegal’ one? Below is my take on this issue. As for the politicians, the way most of us see it – as opposed to the signed up party fanatics – they are ALL wankers [Nick if you object to that phrase please just put stars] and losers. As for Stournaras, he has tolerated & exonerated the continuation of rousfetia appointments at salaries that are insulting to greeks everywhere – 3500€ pm? 3000€ pm? Now? when top consultant doctors and university department heads are on salaries at & below 1500€ pm? Who is more important here? The professionals we need or the petty political appointees in Simos Kedigoglou’s office whom he raided ERT to pay for? So Stournaras is as dirty & systemic as all the rest. To my mind, an unaligned & uncorrupt greek, our politics and power set up is totally vile and rotten beyond imagination. In fact, frightening. As for Stefanos Manos’ and Drasi’s statements re ERT, they really missed an opportunity to my mind and proved that they are only politicians after all. Their concern is the biased news – and whose fault is that? not ERT’s – and neither had the courage to point out the simple truth, that ERT and all media had performed a blackout on Drasi in the last election. Which is a total scandal (but not ERT’s fault). Instead of bringing this out in the open they play the opaque innuendo game of greek politics. Further, seeing only through a political lens, they fail to see that ERT has a value in itself above & beyond the standard greek biased and propagandised political reporting – I repeat, whose fault is that? not ERT’s – and that political reporting is only one small part of ERT’s programming. ERT is not just about politics. It is a common good ABOVE politics. That is what I am trying to say here. It is a public broadcasting corporation, part of the ‘acquis communautaire’, and its actual owners are the greek citizens. Its programming is invaluable in Greece and for greeks abroad. Most of its programming has to do with superior entertainment, the arts and history, archeology, science, the shipping news, religious services, beauforts, emergency public announcements, the streaming of foreign channels etc. It is absolutely unacceptable to shut this down, and cackhanded to boot. So ERT needs a clean-up? It never got it because the clean-up involves the governments’ abuse of ERT, not ERT itself. Our successive greek governments up to and including the present one (in spades!) didn’t respect it and saw it – since it makes money – as a private ‘bank’ to make fake and totally illegal salaries for their family members, pals and supporters. This all points back to our loathsome & disgustingly corrupt politicians and parties and not at ERT. I think you over dramatize the ERT situation. ERT is not lost. ERT is in the process of being reformed. Every attorney would tell you that you need to create a new entity to draw a line on further losses and liabilities. This is not about fine programming. The internet is full of fine programming of the type generated by public broadcasting. The internet is now the equivalent of the Public Library of Alexandria. There is no way that one could put forward the argument that because a local station closed down for repairs of sorts, that the public is forever deprived of quality programming. Such would be a very partisan and untrue statement. The sort of statement that one could hear from Syriza which sees ERT as an extension arm of its own propaganda apparatus. Those days are over. The new ERT would take the political dimension out and this is what the Left is lamenting. Not the loss of programming, not the loss of pluralism, not the loss of diversity. All these are false arguments to mask the perceived political loss by party apparatchiks coming to an abrupt end. I find Syriza very hypocritical in this false debate about pseudo freedoms of choice. It’s all about losing a foothold that the Left has worked ages to weave through the system and it is about to end because it’s pure free loading; that’s all. BTW, Manos and Stournaras can not be both wrong having represented opposite political spectrums. Could it be that Tsipras is plain wrong and a grand demagogue to boot? I think so. Μπαρούφες Βαρουφάκη για αυτοπροβολή στις δύσκολες ώρες της ΕΡΤ. “Switching off the current will not solve ERT’s problems”. That’s exactly where I, and I think most of us, stand. ERT may have been successive governments’ private cesspit, but ERT – whatever its problems and backstage stories – never failed in its remit to produce high quality programming for us, the viewers. It is ridiculous to shut it down so dramatically. Except as a sop to the Eurogroup. Do we expect a new “clean” ERT to result? Not on your life: corruption and abuse of our public institutions is a political problem, and the politicians certainly haven’t changed. Maybe in the future, politicians who love Greece and want to serve and safeguard her interests will appear. But not yet. Second, try as they might, ERT’s closure impact is not playing out as a partisan story or Tsipras story, etc. Rather, the public vs authoritarian gesture. So maybe the “front” story (ERT) will have cooled off by Monday’s talks…especially with our convenient news blackout unable to stoke the flames! The ERT matter will not be resolved until Greece gets the next 3.3 Bil. tranch due sometime after the June 21st Eurogroup meeting. The German Parliament has to approve as well on the 19th of June. If Germany feels Greece is unstable then the funds would be withheld. By pushing the ERT matter(unable to accept its closure) you are basically making sure that Greece will not get paid. How many times do we have to play this movie to begin to understand it? Everytime the Greek government had a obstacle of funding itself, it crashed whoever/whatever stood in its way. Last November its was the Greek banks, later Cyprus, today ERT. There is no way to stand between a hungry/needy government and its money. This ERT thing (of trying to preserve it as is) is a lost cause. Period. Eleni, you are absolutely right. You have kept to the point and not used this blog to promote political party controversy. Politicians have exploited ERT and are still doing so. What shall we see when it reopens? Who shall we find? Look for the recent appointees: 28 have been identified and are receiving comfortable salaries, political rewards from Kedikoglou. ERT is essential in my daughter’s household! She has her own TV screen so that she can enjoy interesting and informative programmes, rather than football, basket and whatever the men in the family prefer! This must be the case in many homes. “Adjustments are most needed on tourism taxes and privatization deadlines. Foreign tourism is one of the few bright spots in the Greek economy, with as many as 17 million foreign tourists expected this year. Athens wants to attract more tourist spending by lowering the value-added tax on restaurants and tavernas from the current 23 percent to a more tolerable 13 percent. This means fewer tax dollars in the short term for the Greek government, but more jobs and revenues for the struggling private sector. The three official lenders should agree to this. And while the trio’s insistence that Athens sell off mismanaged state enterprises and real estate is sound, the rate of sales to the private sector depends on the willingness of qualified buyers to pay fair market prices. That process hit a big snag this week when the only expected bidder for Greece’s natural gas monopoly, a subsidiary of Russia’s Gazprom, unexpectedly withdrew. The reasons are disputed, but Greek officials say European Union misgivings about Gazprom’s extending its stranglehold over the union’s natural gas market was a factor.